Originally posted December 24, 2012. I understand where she was coming from. When I was a child growing up in the outskirts of Philadelphia, Pennsylvania, fruit cake wasn’t something for children. It was a rum-soaked mass of dark brown substance peppered with bits of fruit that looked more like toys than anything edible. I distinctly remember associating the green and red bits with olives. I still don’t like olives. I’m not too sure about fruit cake either. It makes sense that the U.S. have such a holiday, however. It was sugar from the American colonies that was used to candy fruits, and the proliferation of candied fruits led to an abundance of fruit cake. Three cheers for the plants we found on the land we took from the people that were living here before! 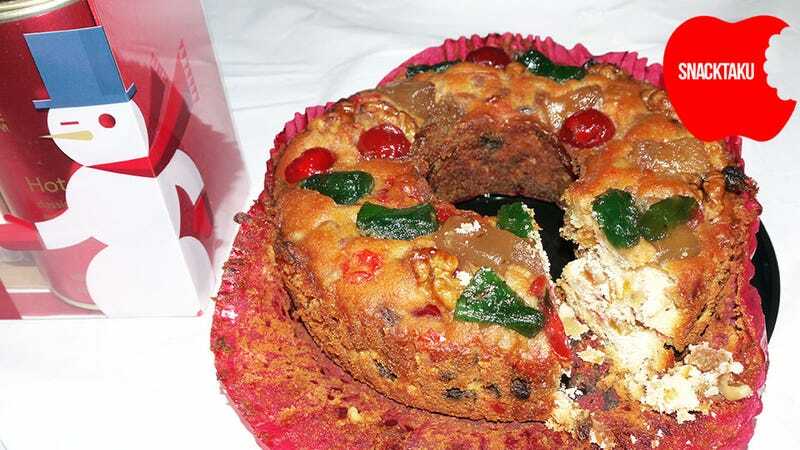 The problem I’ve run into while attempting to craft a fair and balanced review of fruit cake is that the last thing anyone wants to do after munching away on a substantial piece is remember the experience. What I want to do right now is eat something—anything else, on the off-chance that whatever I follow the cake with negate the previous experience. Some of this adverse reaction is due to the density of the fruit cake. It’s easy to forget that one slice of fruit cake contains all of the ingredients of an entire grocery store sheet cake. I’m exaggerating a bit. That’s what I do when I feel like I’ve been eating sugar-coated lead. It doesn’t help that Walmart collectively does not have a clue how to bake. You might have a really good pâtissier at your local Supercenter, but figuring that rarity into the national average barely elevates the entire baking staff of the retail chain beyond toaster pastry level. This is an incredibly dry fruit cake, crumbling apart at every opportunity. The red paper that once covered the bottom of the cake is now a miniature sandbox. I don’t like sand. It’s course, rough and irritating—and it gets everywhere. The main culprit in the unpleasantness, however, is what makes a fruit cake a fruit cake. Those gelatinous green, red and yellow-ish crystals that were once plant matter. Some would argue they still are. I would punch those people. Candying is a process in which fruit is placed in a heated sugar syrup and left there until everything that made it good is replaced with sickly sweetness. It prevents the fruit from spoiling, much in the same way as pushing a man off of a tall building prevents him from killing himself. In small quantities candied fruit is fine. It’s sort of like the inside of a jelly bean. Just imagine a couple dozen massive naked jelly beans embedded so securely in a dense baked good that knights from across the land arrive to try their hand at dislodging it. This is not something you should eat; it’s something Disney should animate. At its best, with moist cake and small bits of candied fruit, the fruit cake is a sweet treat that no one mourns when it flies off to Australia at the end of December. At its worse it’s available at Walmart right now. From all of us as Snacktaku to all of you, ugh. Snacktaku is Kotaku’s take on the wild and wonderful world of eating things, but not eating meals. Eating meals is for those with too much time on their hands. Past critiques can be found at the Snacktaku review archive.